We recognize ourselves as a nation and an original people that accept and recognize their connection with the Great Mystery. We recognize the primary existence of Earth, Air, Water and Fire as the source and source of life, we recognize ourselves as givers of life and as such are our first and closest Family. We recognize the relationship with all beings and principles that come from the same origin. We assume our legitimate right as heirs and custodians of the original knowledge, to practice the teachings and instructions contained in the traditions of our Ancestors. We recognize in our consciousness, the purpose of being absolutely everything we are capable of being, and thus realize our potential as a living expression of Creation. We recognize the same origin and the same brotherhood with all the beings of this earth, and we are aware that the different forms of creed do not separate us. We do not impose a doctrine or a creed but the very pursuit of knowledge and belief. We propose ritual spaces so that each one has an encounter with himself and with the sacred, understanding the sacred as an experience and a personal relationship. We recognize the path of sacred plants as teachers of power and teaching, to use them as a sacrament, seeking and respecting their ritual management and their ancestral form as a vehicle to achieve a state of consciousness and health, rejecting the irresponsible use of these grandmothers' power . The Word as a creative verb and of Good Saying, summons the dream of the Great Spirit and demands its fulfillment. We recognize the power of the word as the expression of the truth of our inner being when we raise it to the four directions of the Universe: We want to be what we say we are; we want to do what we commit ourselves; we want to walk with the value of our word, with a commitment to integrity with what we express through it; therefore, our commitment to use and sustain it, making the Word an action for our life. Our path includes all people, all races, nations and peoples of the four directions of this Earth. It is our decision and desire, to exist in balance of harmony with all that exists, in order to honor our relationships, in the understanding of the unity of the Great Family of Life. In this desire and in this knowledge we form the ecumenical spiritual organization Sacred Fire of Itzachilatlan, and we declare our willingness to make it a legal organization, with presence and recognition at an international level. Our commitment to sustain these forms means a permanent work to generate spaces and temples to gather the different original knowledge, within their own designs, in order to extend and sow the alliance and respect to all the original cultures as an inherent part of this Fire. We believe in humility, will, sincerity and integrity as principles of the search for knowledge, which is sown in the heart as experience and experience of the sacred in ritual. These principles allow us to have a vision to walk each of our lives. We seek and work for peace and dignity, as well as in the rescue, support and reactivation of the ancestral powers to put them at the service of the people. Thus, we want to take a voice in defense of the Memory, of the care of the inheritance of the children;we long to be able to live our mission. The one of taking care of all the life, ours and the one of all the creatures that inhabit the planet, thanks to the goodness and care of the four spirits of the original Sacred Family: the Father Fire, the Mother Earth and our brothers Water and Air. We raise the conscience and the spirit to summon the protective spirits, to take care of the rituals and the good handling of the instruments of the sacred medicines, to recover the memory of how to use them and how to transmit these forms, as our grandparents taught us. This is how we want to live our life, with the power to dream our dreams in the same direction as the Dreams of Creation. 1. 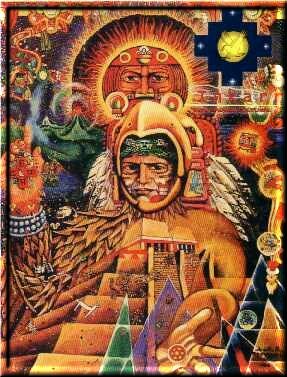 To strive for the spiritual development of people following the guidelines of the Sacred Fire of Itzachilatlan. 2. Prepare, develop and preserve the ceremonial spaces to make the ceremonies of Vision Search, Sun Dance and other designs that are delivered by the Sacred Fire of Itzachilatlan or by alliances. 3. Establish alliances and cooperation agreements with indigenous peoples, spiritual traditions or with entities whose social purpose is related. 4. Promote the conservation and defense of natural resources, their management and use. 5. Constitute areas of special reserves and forestry in lands acquired by the organization. 6. Strengthen the ties of union with the different spiritual traditions and indigenous peoples of Mother Earth. 7. Work in the recovery, conservation, application and dissemination of knowledge of the different forms of ancestral medicine. 8. Organize and perform the ceremonies of the Sacred Fire of Itzachilatlan. 9. Promote the conservation and projection of spiritual, environmental and cultural heritage to future generations, in better conditions of use, conservation and knowledge as a superior material base for their well-being. Note: These principles and objectives have been extracted from several of the constitution documents of the Sacred Fire of Itzachilatlan in other countries. It is not a finished document but open to suggestions.